Hi everyone!! Happy Holidays to you all!! We all had a lovely Christmas yesterday and as we were at home for the day, I decided to wear my new Topshop shiny snakeskin leggings, my black merino wool boyfriend cardi, vintage silver belt and 'Animal' is peeking through too! I'm debating whether to hit the sales today, I am off for another week, so no great rush if I end up just lounging around instead, with scrumptious food to keep me company! A lot of online retailers have some fantastic bargains-it is nice to browse without all the walking around!! Harvey Nichols and Matches were very tempting with their Marc Jacob bags on sale, but I'm not sure what I really want!! Hope you bag a bargain, its certainly worth browsing, either online or to the shops!! Don't you mean Merry Christmas, or Feliz Navidad as we say down here? Hi Rob-Noo, I mean Happy Holidays!!! Plus, Animal will be pleased to know he's a superhero, I'm sure! I adore your cardigan. I love wool. You are pretty. Offer, bid, offer, bid...... I prepare the new year for it. Haha! Sharon my dear how great you had a happy Xmas day. You look so lovely, your smile is just gorgeous. Well here I'm working (well not much, mostly seeing blogs lol) and all the stores are closed. I wish you and your family happy holidays until New Year!!! Hi janet taylor-thanks my dear and yes, hope you do well catching some ebay bargains!! Hi the seeker-thanks for your lovely comment, I wish you a Happy New Year too my dear! Hi Lacouturiernyc-thanks my dear and you too! Hi Yiqin-LOL, I think the economy will be boosted well from today, with all the sales on-thanks my dear! Hi marte-thanks so much too my dear!! I like this outfit. I really like the combination of the printed t-shirt with the cardigan and the silver belt. Glad you're having relaxing holidays. LOL @ your Animal t-shirt! Hope you had a fantastic Christmas, Sharon! happy holidays! and cute tshirt! Such a cute outfit, I hope you had a fantastic Christmas honey. Did u brave the sales? Happy holidays to you! You look lovely, stylish & comfortable. sharon, hope you and your family are having a lovely holiday. Hi cate-thanks a lot my dear! Hi Wendy-yes, he's cute, haha! Hi Couture Carrie-thanks so much, hope you enjoyed yours too! Hi emma-thanks my dear and to you too! 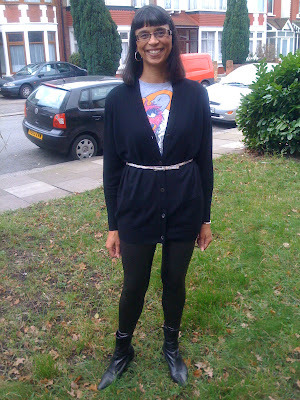 Hi fashion dreamer-yes, I did go out yesterday, I'll update in my next post! Hi Marian-thanks so much my dear, hope your xmas was lovely! Hi ambika-thanks a lot for your lovely comment! Hi savvy-thank you-I hope yours is good too! Thrift Inspiration, doing it the Jumpsuit way! A Very Happy Christmas to you All!! Thrift Inspiration, doing it Balenciaga Style! DIY sequin top-Yay or Nay? Fringe benefits and Blog loving! !